Our phones and tablets help us get things done at work, but sometimes, you’re on the subway with no reception and need to update your spreadsheet before you get to the client’s office. Or you desperately need to make edits to your marketing strategy PowerPoint before you present, but you only brought your iPad to the meeting. We’ve all been there, but now there’s a way out. With today’s launch of the new Slides app on iOS and updates to the Docs and Sheets apps, we’re delivering on our promise to make it possible for you to work with any file, on any device, any time. Now you can use the Google Docs, Sheets and Slides apps on your iPad or iPhone and all other devices (your Chromebook, laptop, Android phone or tablet), to complete the same tasks—online or offline. 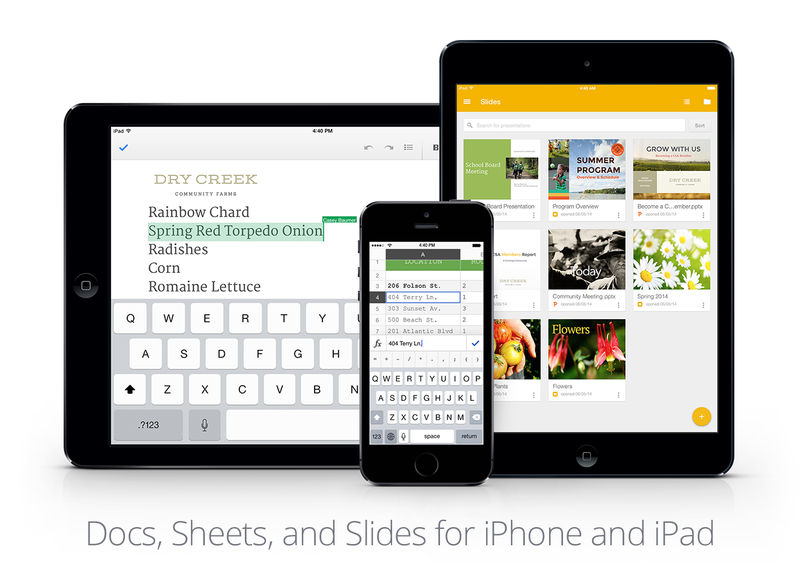 In addition, you can open, create and edit native Microsoft Office files with the Google Docs suite on iOS. According to SoftWatch about 80 percent of Office licenses are only lightly used, with many employees only working with Office for a handful of minutes a day or not at all. If you still have the occasional need, Google has you covered. Use Docs, Sheets and Slides to open up a contract that’s been saved in Word without converting the file, and copy over the crucial figures to an Excel spreadsheet from the client to do some number-crunching on your iPad. Then quickly pop those calculations over to the PowerPoint deck before you walk into a sales meeting, all from whichever device is most convenient. And if you want to collaborate in real-time with your colleagues, you can simply convert these old Office files into Docs, Sheets or Slides and start working together immediately. You’ll even be able to make edits when you’re offline, whether you’re using the app on your phone or tablet, or Chrome on your laptop. No one wants to worry about what format their documents are in or whether they have the right app on their phone or tablet. Whether you’re working on a file originally created in Microsoft Office, or one created in Docs, Sheets or Slides on an Android phone, tablet, iPhone, iPad, Chromebook or laptop, with or without an internet connection, you can do all this and more with Google Apps.